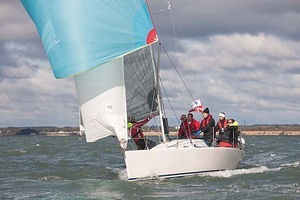 The HYS Hamble Winter Series starts again this weekend after the traditional mid series break at the beginning of November. The second four weeks of the series have only one race per day as the nights close in and the winter proper begins. Even so, these four races can be crucial as discards start to play their part. So, with eight races gone and four to go it is time to look at the story so far. In Class 1, Davanti Tyres the J112e of Chax Ivill and Paul Heys, leads the way with a pretty solid 9 points. However, if, Sailplane, First 40, Rob Bottomley, in second on 17 points can discard the DNS for Race 8 then things become a lot tighter. Dusty P, First 40, Richard Patrick is in third with 20 points. With only 9 points covering third to sixth there is still a lot to sail for. Class 2, is very much a J-Boats battle. Jago, Mike and Susie Yates J109, is in first place on 11 points from Simon Perry's J109, Jiraffe, second with 20. But, once again, Jiraffe has a 15 point DNC to discard. With no cancellations in the series so far, the likelihood of eleven races and three discards is pretty strong. 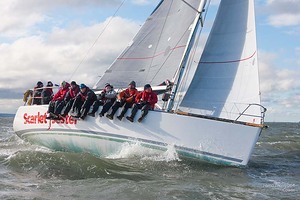 J88 Tigris, Gavin Howe also has 20 points in third place; just ahead of their sister ship J-Dream, Kirsty & David Apthorp on 22 points. 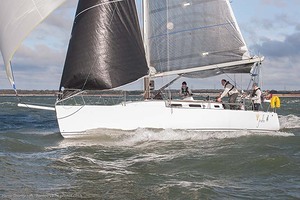 Keeping the next four J-Boats at bay is Robbie and Lis Robinsons First 35, Hot Rats. 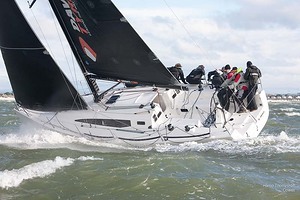 At the top of Class 3 is the Sigma38 of Chris and Vanessa Choules, With Alacrity, on 8 points. Scarlet Jester, the SJ320 of Jamie Muir is just one point back in second. These two have been swapping first places all series, but, With Alacrity, has so far, never been out of the top two. Quokka 9, the Andrieu Half Tonner of Peter Rutter is back in third on 17 points, but, carrying a DNC worth 17 points in this class she could easily be back in the mix. Also lurking down the list with two DNCs to get rid of are David Greenhalgh's J92, J'ronimo and John Noe's X332, La Nef IV. 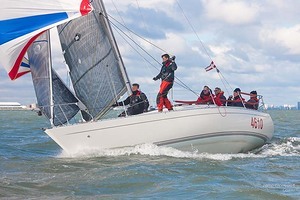 The Sigma 33 of Toby Gorman, Stan the Boat, is in first place with an impressive 8 points in Class 4. M'Enfin? !, the Corby 25 of Sophie Chudziak and Bertrand Malas, are hanging on in second having 13 points, with a very solid series of first, second, third and fourth places. This is no mean feat in the smallest boat in a seventeen strong class. They are holding off Ian Handley's Mustang Mk2, Gr8 Banter who has 17 points. 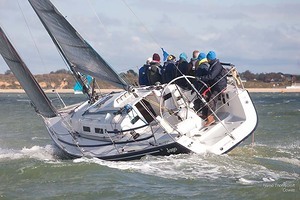 One of the HYS Hamble Winter Series' great supporters, Force 4 Chandlery, will be the day sponsor this weekend. Force 4 at Port Hamble Marina open early on Sunday mornings to cater for last minute purchases by our competitors. Watch out for Force 4 money off vouchers at the prize giving in the club on Sunday lunchtime, always useful for Christmas presents at this time of year. Remember, if you don't come in your prize will cascade down to the next boat. For the rest of us it will just be beer and chips as usual.